The very things that we find amazing about him (aside from his affinity for camera-mugging-personality) is the idea: HOW–does he get so much out of so little? Congratulations. You’ve played a C Major chord with as little effort as possible. 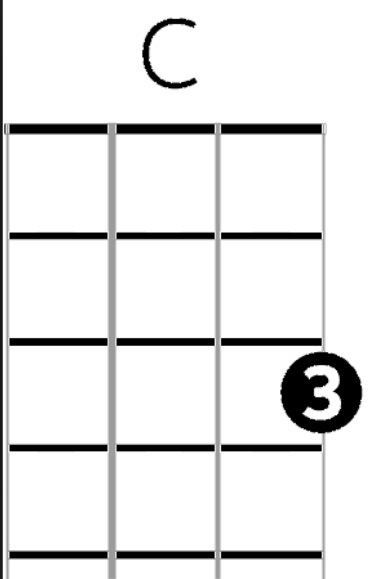 And the first chord to Iz’s “Somewhere over the Rainbow.” You’ve got five or so left if you want to learn it. I remember a time when I was obsessed with the sheer plurality of “gear,” no matter the job, hobby, endeavor, goal, or whatever. This particularly was the case, when I started playing guitar. It was the 1980’s and I believe I actually started playing around the age of 13. The eighties were an embarrassment of potential guitar riches for a wannabe. I mean, by the time I picked up a guitar, Eddie Van Halen had barely been three records deep and “Eruption” was the Paganinni’s 24th caprice of the electric guitar. At the time, the “Cadenza”–or guitar solo–was a prerequisite for EVERY song, pop, rock, country, and even New Wave. The irony was, I was playing the riff to “Smoke On The Water.” Four notes. All the attention to coolness came from the simplicity of the core issue: the music. But the 80’s also placed in me the idea that to be good–or sound good–I needed five Marshall stacks, three digital delays, a wah pedal, a Floyd Rose locking nut system with fine tuners, a scalloped neck, and a host of effects that took the labor out of tone, and allowed one to plow away as the Dionysian rock god we all wanted to be. And thus, the pressure was internal. All the desire to “make it one day” was eternally suffering at the hands of some self-imposed acquisitional doctrine. Did I mention that Brushy One-String has 50,000 more hits than my dopey film I made? I can stretch this example across nearly everything I have come to learn in my life. It’s not good enough to read one book by CS Lewis at a time. No, I MUST scour Ebay and used bookstores obsessively until I find them all. So instead of digesting the apologetics, the theological parallels, the beautiful analogies, I’m more concerned with hoarding until some quasi-intellectual Y2K hits–which probably never will. So one day, I learned to intersperse a “groove” while playing the guitar, but a self-generated one; one devoid of drum machines, loop generators and the like. I started playing the guitar with a percussive undertone. This is something that I am now applying to the Uke as well. The next thing you know, I noticed it got the attention of a listener. Less was truly more. I stated to look inside for the source of the “groove,” and not have it delivered via FedEx overnight. When I picked up Tenkara fishing, it allowed me more time to read the water and to scope out my stealth and positioning. Fumbling with gear, lines, leaders, split shot and the timing of a may fly hatch IS fun. That in itself is a journey I’d encourage all to take. As was the time I ran my Ukulele through my tube amp with an overdrive pedal. It was virtually indistinguishable from a guitar like that. But I lost the Uke in the process. This is why–and I am now formulating my approach-my guitar and Ukulele classes I will be teaching will be different from normal. I want you to have a competently made instrument that doesnt kill your hands. I want you to make the appropriate introductory investments. But then, we’re going to talk about groove. Timing. Space. Phrasing. How to make even the banal-sounding scales around cool and intriguing, instead of sounding like a rudimentary clarion call to Jack Kevorkian. So go back to the video for a second. Ask yourself a question. If that guy were doing a seminar–if that guy decided to have one closed-door logrolling session for a day, with the promise to teach YOU how to play “Chicken in the Corn” with reasonable ease, do you think it would sell out? I do, and not because of novelty. Because he has the groove we all love in our music. I can play Bach’s Bouree in E Minor on all six. I’ve learned a few complicated bits for the sake of breaking down the seven modes inherent in the Ionian(Major) scale. And I love those things, and they will forever be a part of my public repertoire. But sometimes I just want to jam like Brushy One String. This entry was posted in Guitar, Music, Tenkara, Ukulele, Uncategorized and tagged C.S. Lewis, Tenkara, ukulele. Bookmark the permalink.